Sprinkle the gelatine over the cold water in a small bowl; stand for 3 minutes. Microwave the gelatine mixture on medium (50%) for about 20 seconds or until dissolved (or stand in pan of simmering water until dissolved). Combine warm gelatine mixture and juice in a large jug. Pour jelly into large bowl. Refrigerate for 1 hour 30 minutes or until almost set. MASCARPONE MIXTURE Meanwhile, beat the egg yolks, half the sugar and all the vanilla bean paste in a small bowl with an electric mixer until fluffy. Beat the mascarpone and liqueur in a large bowl with a wooden spoon until well combined; gently fold in the egg yolk mixture. Beat egg whites and remaining sugar in a clean small bowl with an electric mixer until soft peaks form. Gently fold egg white mixture into mascarpone mixture. Spoon half the jelly into the base of a large trifle bowl. Brush the cut-side of the sponge fingers with liqueur; top jelly with half the sponge fingers, breaking up to fit the dish. 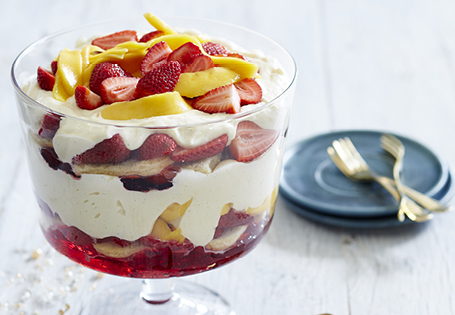 Top with half the combined strawberries and peaches, followed by half the mascar­pone mixture. Repeat the layers, ending with the mascarpone mixture. reserving peaches and strawberries for later. Cover with plastic wrap; refrigerate for several hours or until firm. To serve, top with the remaining combined strawberries and peaches.